SOMALI REGION– Yahas Jamal is a village located 20 kilometres from the town of Gode, its residents live along the banks of Shebelle River. Although the village is situated close to the river, fetching water is a hazardous task requiring the person to risk attack from basking crocodiles. It is because of these crocodiles that the village got the name Yahas (meaning crocodile in Somali). 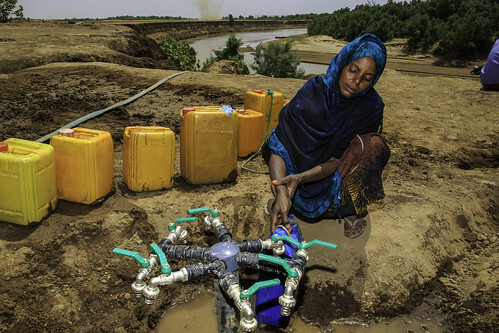 Fortunately, UNICEF, through the Development Regional States (DRS) Joint-UN Programme, has started constructing river intakes in Yahas Jamal and Sankabar villages to improve safe access to water. 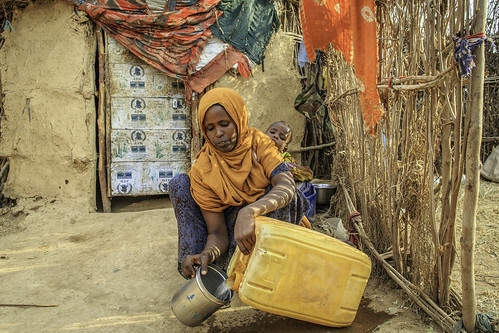 Fartun Hassan, 25, mother of 4, pour water for cooking in Yahas-Jamal Keble in Somali region of Ethiopia. This village which is ODF (Open Defecation Free), is waiting for the completion of water intake project to have a regular access to water. 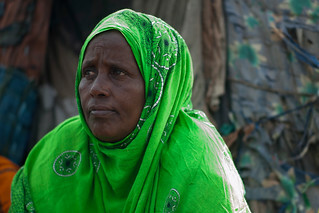 Fartun Hassan, 25, has four children. Besides her household chores she supports her husband through farming and looking after cattle. Every day she undertakes a two-hour journey to reach the river to bring water back to her family. “Luckily I have two donkeys so I only go once a day to fetch water. I bring four jerry cans and it is enough for the day. I know people who have been eaten by crocodiles and most people have lost sheep and goats. I am scared every time I go to the river,” she says. “When they finish this water project, I hear that we will have clean water in the community and our children will not get sick. I wish that it will be completed soon,” she says. Istahil Sohane, 28, has four children. She needs to go the river twice a day because she only has one donkey. “I am eagerly waiting for the river project to finish so I do not have to go to the river twice in one day, which is very tiresome. I cannot send my children sometimes when I am tired because I worry the crocodiles will eat them. 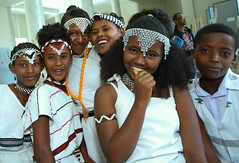 Better me than them.” Getting water is costly for those who do not have the means to truck water. At the moment people are paying between 10 to 20 USD per month. When finished, the Yahas Jamal river intake will provide a reliable service to 300 households in the area, while the cost of water will reduce to only two or three USD per month. 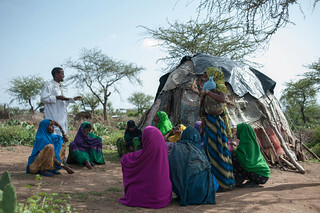 Seada Sheik Abudi, 30, mother of 5, fetches water at a water point in Debaldek Village in Ber’aano Woreda by Shebele River in Somali region of Ethiopia. This water was treated with the emergency system which was set up several years ago but the habitants are still using it to fetch water. Near Yahas Jamal is a small village of Debaldek. The villagers still use the Emergency Water Treatment System (EMWAT KIT). Although the treatment is no longer available they use the system to avoid crocodiles. 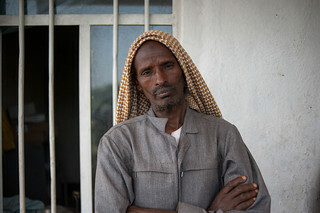 Seada Sheik Abdi, 30, has five children and is fetching water using the EMWAT kit. “It’s better to get water here. It is safer. We are not worried that our family will be attacked by the crocodile,” she says. “If there was clean water I would not have to make four trips here in a day. I need eight jerry cans of water, which takes up the majority of my time.” The district administrator, Aden Mohammed Gile, acknowledges the need for a more reliable water supply: “We would like to move the community to a more sustainable water supply. But currently we have no other alternative and we are waiting for the river intake project to finish. There are other villages far from the river intake and they are also using the EMWAT kit for daily water use, we really need more resources to provide to every village,” he emphasises. Today, UNICEF is developing a mitigation plan in the Somali Region to deliver a sustainable supply of water by tapping into existing water sources that will provide an adequate quantity and quality of water throughout the year. 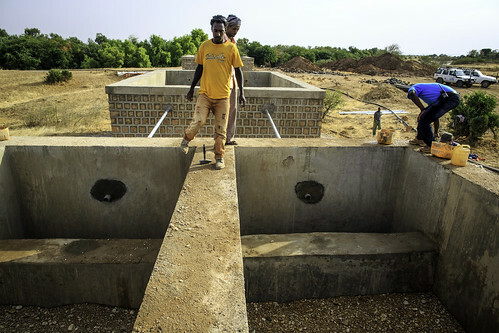 Filtering tanks are filled with gravels inside one of 3 filtering tanks of a river intake construction by Shebele River in Yahas-Jamal Kebele in Somali region. 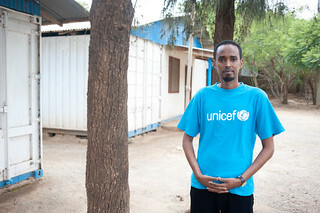 Besides the emergency response to seasonal flooding or drought, UNICEF is focusing on making its WASH programmes resilient. 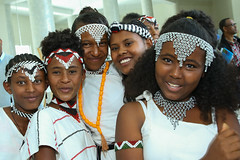 “The river intake programme in Yahas Jamal and Sankabar when complete will support around 1,300 households and is one of the means to provide clean water to the people. 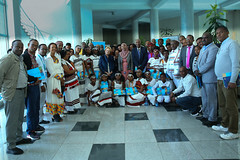 But we need more funds to construct more river intakes in villages along the Shebelle river basin so people living close to a water resource do not have to struggle with crocodiles and disease,” says Samuel Godfrey, UNICEF Chief of WASH. In the coming few months, Yahas Jamal and Sankabar villages will have clean water. Other villages are waiting to see if the time will also come for them to also get the new infrastructure. But for now, Istahil and her neighbours have to endure the time consuming and life endangering task of fetching water like the rest of the women in the villages.